Buying in bulk makes sense. 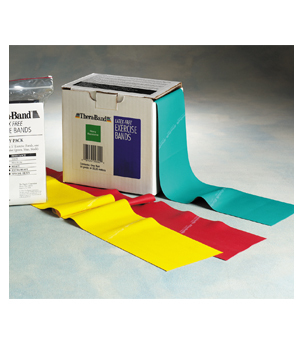 Our Thera Band Latex-Free Exercise Resistance Bands dispenser allows you to cut custom-sized bands for your clients. The bands are 4" wide and the box contains 25 yards of your choice strength. Thera Band Latex-Free Exercise Bands are designed to provide the closest usage characteristics compared to Thera Band Exercise Bands made with latex. The bands are 4" wide and the box contains 25 yards of your choice strength of Exercise Resistance Bands. We use these bands to build and train for strong and happy shoulders. We choose these in particular because we know some of our current and future students could have an allergy to latex. These bands can be used by all of our students. We use these bands regularly both in the physical therapy clinic. 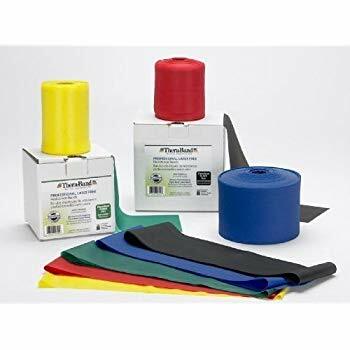 We've purchased theraband products from multiple vendors. Yoga Direct has wonderful discounts which makes supplying these bands to our clients and patients very affordable. Great quality product with fast shipping. After searching everywhere for the best price on bulk thera band equipment, I've finally found Yoga Direct. I loved the quality of these bands compared to others I have tried. Members also commented that they liked them better. The resistance was true to the color for the red and the green bands. Blue - too narrow, slips off the feet, slippery. Strength okay. Delivery very good....will see if there is a wider band and order a stronger colour next time.